In the complaint filed in Los Angeles County Superior Court, Chinese-based firm Beijing MVC Consultant Company says it entered into an agreement in April 2016 with one of Jia’s subsidiaries to conduct a survey of potential customers in China for Faraday’s first production car, the FF 91. Beijing MVC sent a $180,000 invoice for its work to the subsidiary, Leshi Automobile, a branch of Jia’s publicly-held Chinese firm Leshi Holdings, on Sept. 1, 2016, and the CEO’s firm had 60 days to pay up. But that never happened, according to the complaint. “The reply from the Leshi Automobile stated that they lack the money and suggested Beijing MVC wait for payment,” the complaint said. By early 2017, yet to be paid, Beijing MVC said that it filed suit against Leshi Automobile in a local Chinese court. A judge ruled in favor of the consultant, the complaint said, but Jia’s subsidiary still hasn’t complied with the order. Part of the reason has to do with Faraday’s rapidly deteriorating financial outlook in 2017, as Jalopnik has reported. Jia, as well, had a number of financial problems of his own to deal with. LeEco, Jia’s umbrella of tech companies, had crumbled under insurmountable debt, which preceded a Chinese court eventually frezing his assets. By the end of the year, the Chinese government placed him on a government debt blacklist, precluding Jia from taking flights or making big purchases. He hasn’t returned to the country since, and remains in California. Beijing MVC’s complaint alleges that statements made by Jia during 2017—particularly that he pledged to repay all of Leshi’s debts—means it can seek recourse in a California court. But as the consultant puts it in court, Jia purposefully designed a network of shell companies with the explicit intention of evading certain debts. “[Jia] set up many companies but failed to maintain separate identities of companies,” the complaint alleged. “All these companies are wholly [owned] subsidiaries of Leshi Holdings.” The companies have the same logo, officers and corporate information, Bejing MVC claims, and they’re all controlled by Leshi Holdings. Since Faraday now has control of the study completed by Beijing MVC, the consultant alleges it should be held liable because Faraday is “unjustly enriched” at the consultant’s expense. A Faraday spokesperson didn’t respond to a request for comment. Attorneys for Beijing MVC couldn’t be immediately reached. Jia has been accused of commingling funds and creating confusing corporate structures in the past. When irregularities became apparent in Faraday’s books in 2016, the company’s then-director of corporate financing directly raised concerns about apparent commingling of funds due to the convoluted corporate structure of Jia’s empire, a lack of internal controls, and insufficient bank account procedures. There’s also the overlap of Jia’s projects. 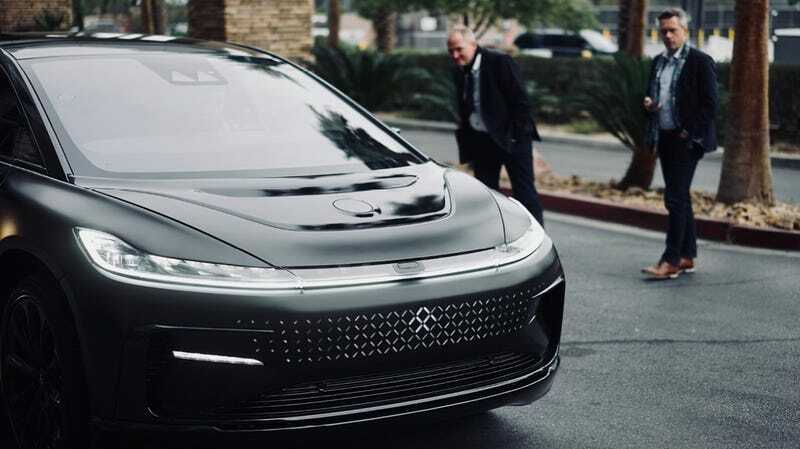 As Faraday raced to introduce the FF 91 at the 2017 CES Conference, for example, Jia had members of the startup’s team pulled away to finish a different electric car for LeEco, Jalopnik previously reported. Beijing MVC asked the California court to order Faraday and Jia, who’s named as a defendant, to pay the contract fee. Faraday and Jia have yet to respond in court. The Verge reported last month that Beijing MVC had filed suit against Faraday. The study completed by Beijing MVC—submitted as an exhibit to the complaint—provides interesting insight into how Faraday could see itself fitting into the fledgling EV market. The consultant set out to get a sense of how customers feel about the FF 91—a luxurious, hyper-fast all-electric car—and appeared to have an intense focus on Tesla owners and what they like about the Model S, a likely competitor to the FF 91. Meanwhile, Faraday recently revealed who backed its latest financing round that saved the company from insolvency. Evergrande Health, a subsidiary of Chinese real estate giant Evergrande Group, acquired a 45 percent stake in the startup for $2 billion, The Verge reported late last month. As long as Faraday hits certain targets laid out in the investment deal—which have yet to be disclosed—then Evergrande will disburse an additional $600 million by the end of 2019, The Verge reports, on top of the initial $800 million investment, followed by another $600 million by the end of 2020. The investment marks a turnaround of sorts for a company that only a year ago had been scrambling to recover from an abandoned $1 billion factory in Nevada, along with a relentless turnover of executives. Faraday is currently duking it out with one of the departed execs, former CFO Stefan Krause, who the startup claimed had committed “malfeasance and dereliction of duty” before allegedly leaving with employees to launch a new startup of his own. Krause has vigorously denied the claims. The mountain of legal claims aside, Faraday still believes it can get its first production car out the door by the end of 2018. When the California factory is up and running, the company said last month, it will employ up to 1,300 people working a three-shift schedule.